Get a taste of a Spanish dish known as paella brought by Spanish settlers to New Orleans. 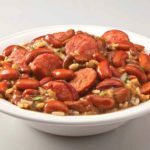 Jambalaya or “Jambon a la Yaya” is a rice-based dish recipe that is made with Louisiana rice cooked down with smoke pork sausage and cubes of pork loin, and baked to perfection. Frozen and package in a 12oz. microwaveable bowl. Satisfy your craving for Cajun food anytime you want in less than five minutes. Water, pork, long grained enriched parboiled rice [niacin, ferric orthophosphate (iron), thiamin mononitrate (thiamin), folic acid)], smoked sausage with pork [pork, water, salt, sugar, red pepper, white pepper, sodium nitrite (curing agent), garlic], onions, green bell pepper, green onions, Kitchen Bouquet [caramel, vegetable base (water, carrots, onions, celery, parsnips, turnips, salt, parsley, spices), sodium benzoate (less than 0.1 of 1% to preserve freshness), salt, red pepper, and other spices, garlic, silicon dioxide (to prevent caking), dried parsley, garlic powder, red chili pepper flakes, and white pepper.